Studying medieval skeletons is a direct way to obtain information about life in medieval societies with very little other information available about the living conditions of ordinary people. In this paper we investigate how Hg is distributed in soil samples surrounding seven medieval skeletons excavated at the cemeteries Lindegaarden in Ribe and Ole Wormsgade in Horsens, both situated in Jutland, Denmark. The analyses have been performed using Cold Vapour Atomic Absorption Spectroscopy (CV-AAS). The results show systematic variations of the Hg concentrations in soil samples as a function of distance extending horizontally from the femur. Two individuals showed soil Hg concentrations at the background level, below ca. 100 ng g-1, whereas soil samples surrounding the other five individuals exhibited much larger Hg concentrations. Our interpretation of the data is that in general the Hg, which was once situated in the soft tissue, is still present and in-place in the soil now surrounding the skeleton. Due to the overburden of ca. 3 feet of topsoil the residual of the soft tissue has been condensed into the mid-plane of the flattened corpse. The decomposed soft tissue now mixed with the soil can in this way be sampled near the femur as well as from the inner organs: the kidneys, the liver and the lungs. Medieval people were subjected to an Hg exposure, which can be divided into a global background exposure and occasional much higher point source exposures of cultural origins. In non-monastic environments the individuals were mostly exposed to Hg in connection with treatment of diseases, a modus operandi already practiced by the Romans as described by Pliny the Elder  (see further details in Rasmussen et al.). In femoral samples the medieval background exposure gave rise to concentrations levels of between 10 and 100 ng g-1, while individuals exposed to Hg in connection with medication may exhibit Hg concentrations up to several thousand ng g-1[2, 3]. Under normal conditions in Northern European medieval cemeteries only the bones are preserved; the decayed soft tissue is now normally part of the soil surrounding the skeleton. However, it seems that the Hg which was originally present in the soft tissue is now often still in-place and preserved in the soil. Rasmussen et al. reported Hg in soil profiles of three individuals extending horizontally and vertically away from the femur, thus sampling what was previously the soft tissue, and excluded the possibility of diagenetic transport of Hg in this connection. The most likely explanation for Hg still being in-place in a situation where so many other compounds and elements have been dissipated by diagenesis is that Hg with its high affinity of S very soon ended up as HgS, which is very stable indeed in the geochemical environment . Here we present more measurements of Hg in soil surrounding medieval skeletons and present a further discussion of how it is preserved and how the concentrations can be interpreted in accordance with the chemical life history hypothesis [3, 5]. The individuals investigated in the present work are from two cemeteries in two medieval towns in Jutland, Denmark. The first is Ribe, which is one of Denmark’s oldest towns, if not the oldest [6–8]. The investigated graves are from the cemetery Lindegaarden adjacent to the cathedral and probably from the 11th century. The site was excavated in 2008 and 2009 by Sydvestjyske Museer (excavation code ASR13, Additional file 1). The second site is Ole Wormsgade in Horsens, a large medieval town further north in Denmark [9, 10]. The cemetery excavated in Ole Wormsgade probably belonged to the parish church, Church of Our Lady, and the graves investigated are from the period 1250 to the protestant reformation in 1536. The cemetery was excavated by Horsens Museum in 2009 (excavation code HOM 1649, Additional file 2). The samples were in all cases taken with kind permission from the archaeologists during the excavation, when the skeleton was halfway exposed in the plane. An in-house build handheld hollow and sharp drill was used for taking cylindrical soil samples of 6 mm in diameter and ca. 2 cm in length and weighing 1–2 gram (see Figure 1a). The stainless steel tool was decontaminated in distilled water between each sampling in order to rid the utensil of any Hg cross contamination. Fieldwork securing the soil samples. a: Sample being transferred from the in-house build stainless soil drill to a glass vial. b: A femur bone with adjacent holes in the soil after sampling. The distances between the holes are 1 cm. The sampling strategy was that the samples were taken at the precise time during the excavation when the upper parts of the skeleton were visible in the excavated plane, but before the soil of the mid-plane of the corpse was removed. We took a vertical miniature drill core ca. 2 cm in length and thus covered the majority of the remains of the decomposed soft tissue which is compressed in the vertical direction due to the overburden of the ca. 3 feet of topsoil. Approximately 10 samples were taken horizontally away from the femur, 1 cm apart as shown by the example in Figure 1b and schematically in Figure 2. In some instances further soil samples were procured directly downwards after the femur was removed, some of these vertical profiles are shown in the diagrams marked “v”. Soil samples were also procured from what were once the inner organs: kidneys, liver, and lungs. These sampling positions were chosen at places where no other inner organs overlapped them in a condensed vertical view of the corpse. The sampling positions of the inner organs are indicated with red crosses in the schematic diagram in Figure 2. The liver samples were taken 2 to 7 cm right laterally from the tenth thoracic vertebra. The lung samples were taken ca. 1 cm below the first rib, and the kidney samples were taken outside the second lumbar vertebra under the twelfth rib. Schematic diagram showing the sampling positions of the soil holding only liver, lung and kidney tissue (positions marked by red crosses). The samples were transferred to and sealed in pre-cleaned glass vials and stored in a refrigerator at ca. 5 degree C until the time of analysis, as recommended by Ure . Prior to dissolution, the soil samples were homogenized according to the grab-sampling procedure developed by Pierre Gy . The mechanically homogenized bulk soil sample was placed along an in-house build aluminum-shelf. Ten subsamples, each of ca. 40 mg, were taken out randomly with an in-house build stainless steel grabber, ca. 4 mm wide and with sharp, vertical walls. After grabbing, the ten subsamples were mixed and homogenized. The utensils were cleaned and exposed to an ethanol flame after each sample. The bone samples were decontaminated and sampled as described in Rasmussen et al. [2, 3] and they were in all cases from the femur. Only compact bone tissue was sampled. In this study we report data from seven individuals. These were selected in an illustrative way amongst a total of 19 individuals studied. Out of 5 individuals from Ribe, 4 were highly exposed to Hg and one moderately exposed to Hg; out of 14 individuals from Horsens, 3 were highly exposed, 4 were moderately exposed, and 7 were not exposed to Hg above background levels. The ca. 400 mg of grab-sampled and homogenized soil was transferred to a pressure liner from an Anton Paar Microwave oven digestion system together with 3 mL analytical grade concentrated HNO3 and 3 mL analytical grade concentrated HCl. The samples were then digested using a temperature program consisting of 15 minutes ramping up the temperature using 800 W, 15 minutes hold time at 180°C, and finally ca. 1 hour of cooling time . Using this method, Gu et al. achieved a yield of between 79 and 109% Hg recovery on soil samples of known Hg concentration. After cooling, the samples were filtrated through a 0.22 μm cellulose acetate Qmax filter, which was eluted afterwards in 10 mL 1.5% analytical grade HNO3 diluted in distilled water. Both the sample and the rinse solution were transferred to a volumetric flask. Finally the sample was diluted with distilled water until 50.00 mL. The final HNO3 concentration in the diluted sample was about 1%, which is well suited for analysis in the CV-AAS. The bones samples were dissolved using ca. 70 mg of bone sample in 6 mL HNO3, 3 mL H2O2 and 1 mL HCl, all concentrated and all of analytical grades. Mercury was measured by CV-AAS (cold vapour atomic absorption spectroscopy) on a dedicated mercury analyser, a Flow Injection Mercury System (FIMS-400) by PerkinElmer equipped with an Au-trap. Two hours prior to analysis 1 mL of concentrated KMnO4 was added to 10 mL of dissolved sample in order to maintain Hg on ionic form. The sample was then diluted to 20 mL. In the reaction chamber of the FIMS-400 the Hg was released as vapour by adding NaBH4. All samples were measured in triplicate. The overall uncertainties, i.e. including reproducibility and dilution, was estimated to be ca. ± 10% (1σ), and the LOD was ca. 20 ng g-1 for a human bone sample of ca. 70 mg and ca. 5 ng g-1 for a 400 mg soil sample. An in-house human bone standard was dissolved daily together with the bone samples and included in the daily runs in order to monitor any drift in the systems. However, the inhomogeneity of the in-house standard ranged in Hg from 70 to 100 ng g-1 and was in all normal cases larger than the analytical uncertainty. 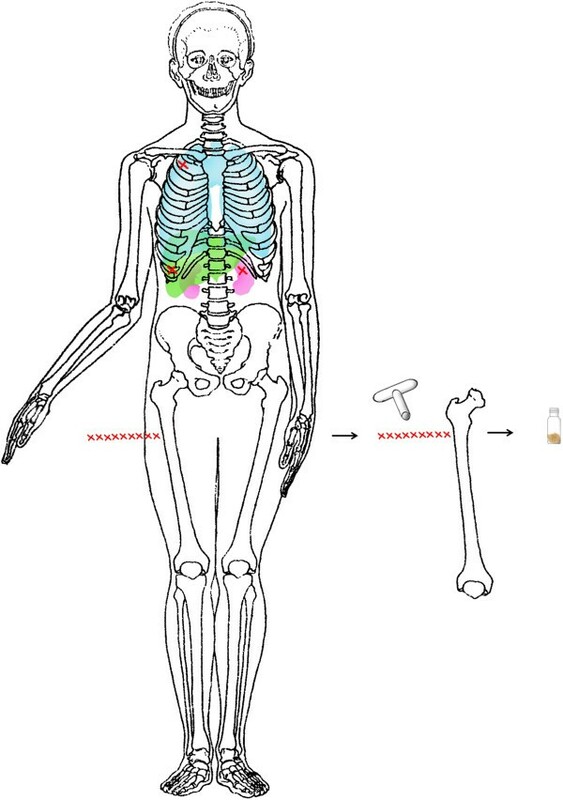 The results of the Hg measurements are listed in Table 1 and shown in the diagrams of Figures 3, 4, 5, 6, 7, 8, 9, where the analysis of the bone sample is depicted to the left in the diagrams. The x-axis scale in the diagrams signifies the distances in cm of the soil samples from the femur – horizontally and vertically (vertically marked with a “v”). To the right is depicted the concentrations of the soil samples from the inner organs. We have attempted to present the data in order of progressively shorter half-lives of Hg in the tissue types, starting with the longest half-life to the left (the bone sample) and the shortest Hg half-life to the right (the lung tissue). The uncertainties quoted are the combined ± 1 standard deviations calculated from a combination of the uncertainty from the calibration curve and the variation from three independent replicate measurements on the same solution. n.d. means not determined. 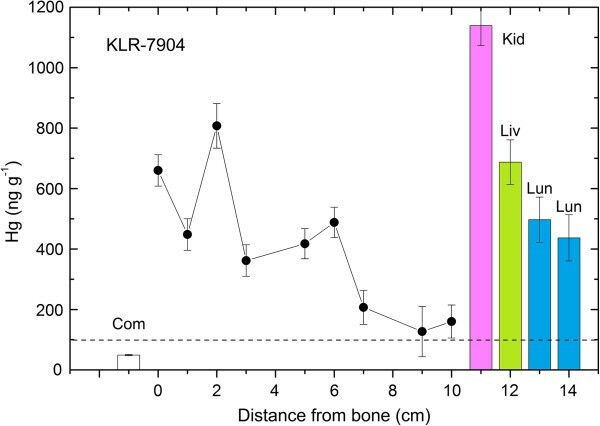 Mercury concentrations determined for bone and soil samples of KLR-7918 from grave X1578 in Ole Wormsgade in Horsens. Mercury concentrations determined for bone and soil samples of KLR-7915 from grave X1572 in Ole Wormsgade in Horsens. 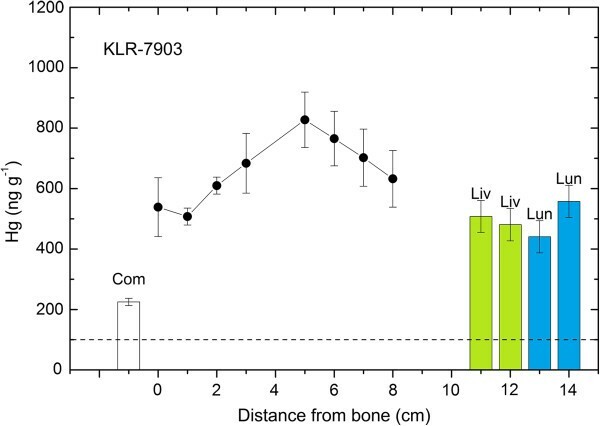 Mercury concentrations determined for bone and soil samples of KLR-7912 from grave X1526 in Ole Wormsgade in Horsens. Mercury concentrations determined for bone and soil samples of KLR-7903 from grave X1115 in Lindegaarden in Ribe. Mercury concentrations determined for bone and soil samples of KLR-7914 from grave X1574 in Ole Wormsgade in Horsens. Mercury concentrations determined for bone and soil samples of KLR-7904 from grave X1117 in Lindegaarden in Ribe. 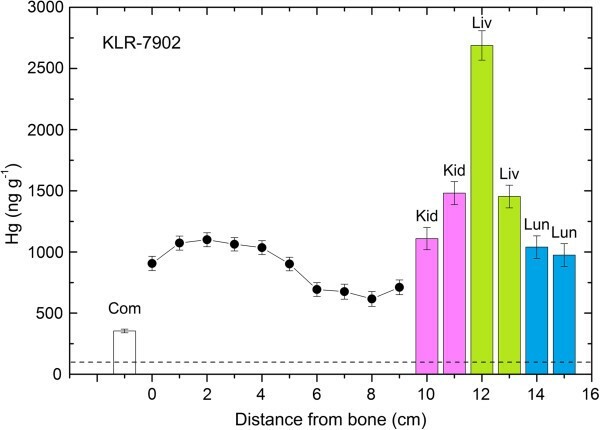 Mercury concentrations determined for bone and soil samples of KLR-7902 from grave X1114 in Lindegaarden in Ribe. In the first example shown in Figure 3 the individual is a 30–40 years old male from Horsens (KLR-7918, grave X1578). He was exposed only to the global Hg background. The threshold level for such non-exposed individuals is approximately 100 ng g-1, a value shown as a dashed line in the diagrams. In the second example shown in Figure 4, the grave of a teenager of age ca. 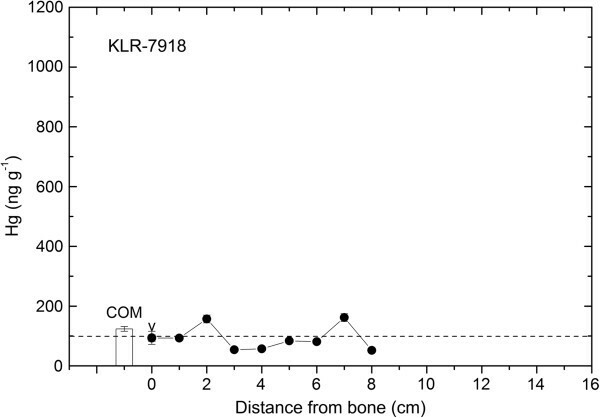 15 from Horsens (KLR-7915, X1572), the compact bone sample showed a Hg concentration of ca. 300 ng g-1, which is definitively higher than the threshold value of ca. 100 ng g-1. However, the decayed soft tissue values of the soil samples were at the threshold level. This indicates that this individual was exposed to Hg earlier in his life, several years prior to death. Turning to the individuals with a more pronounced Hg exposure, Figure 5 shows the measurements on KLR-7912, grave X1526, a 30–40 year old woman from Horsens. She experienced an Hg exposure relatively late in life – no signs of above background Hg in the compact femur sample. The soil samples next to the femur showed high Hg concentrations of on average 400 ng g-1, and the lung tissue exhibits about the same concentration. As said the exposure took place relatively late in life, maybe in the last 6 months or so before her death. A similar exposure pattern was seen for the individual in the grave X1115 (KLR-7903) from Ribe, which was that of a 21–27 year old male (Figure 6). The femoral bone sample had an Hg concentration of ca. 200 ng g-1 and the lung and liver tissues around 500 ng g-1. Here the soft tissue sample next to the femur exhibited a somewhat higher Hg concentrations of on average 700 ng g-1. Soaring Hg concentrations were observed in the last three individuals. 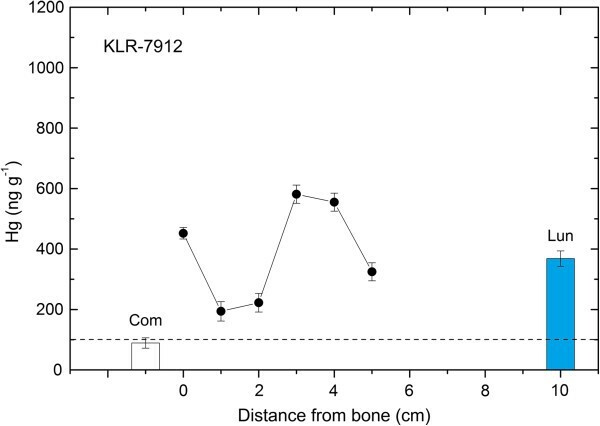 In grave X1574 from Horsens, a 35–45 year old woman with lepra and/or tuberculosis (KLR-7914, Figure 7) the soil sample next to the femur had an average Hg concentration of ca. 400 ng g-1, but the lungs exhibited values around 600 ng g-1 and the kidney sample ca. 950 ng g-1. In the grave X1117 from Ribe (KLR-7904, Figure 8), a 14–17 year old male, the soil samples next to the femur fell from 800 ng g-1 close to the femur to 100 ng g-1 9–10 cm away, which could indicate that the compaction plane of the corpse did not coincide with excavation plane, and that values around 800 ng g-1 are a more fair representation of the soft tissue values of this individual. Here the soil sample from the kidney showed an Hg concentration of ca. 1100 ng g-1, the liver 700 and the lungs 400–500 ng g-1. This indicates that the exposure took place shortly before death - maybe a couple of months before, as the Hg halftime of the kidneys have been determined to ca. 64 days . 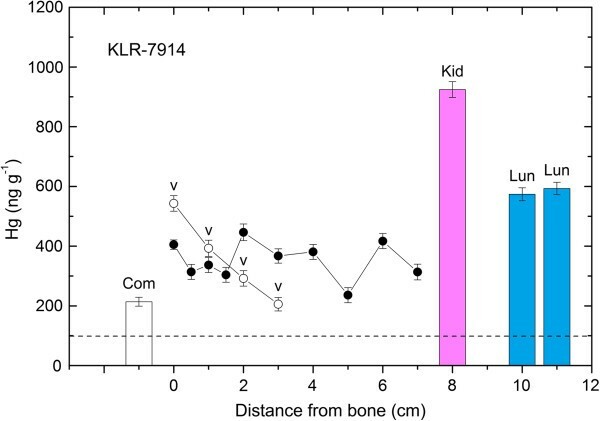 The most astonishing exposure in our data set is that of KLR-7902, a 10–13 year old child from Ribe in grave X1114, where the bone Hg concentration was relatively low, but the soft tissue samples next to the femur varied from 1100 to 700 ng g-1, and the inner organs sported concentrations from ca. 1000 to 2700 ng g-1. One of the two liver samples exhibited the highest value measured: 2688 ± 120 ng g-1. Following the idea of chemical life history, this individual was exposed to Hg shortly before death, as it is an educated guess that the turnover time of the liver is somewhere between those of the 64 days of the kidneys and the 1.7 days of the lungs . The basic reason that the Hg is still in-place in the soil is probably the high affinity of Hg to S, which causes the strong binding of HgS not easily mobilized in the geochemical environment . Irrespective of whether the Hg was present in organic or inorganic form while the individual was alive, it is likely to be precipitated as HgS after the decomposition of the corpse. The fact that some individuals (14 in the whole study) exhibited Hg background levels both in the bones and in the soil gives further credence to our interpretation that elevated Hg concentrations in the soil adjacent to some of the other medieval skeletons are indeed caused by the deposition of Hg from the now decomposed soft tissue. Yet another factor giving credence to the interpretation is that of the shadow zone. When a corpse undergoes decomposition it is compacted by the overburden leaving the soft tissue flattened in the vertical direction. 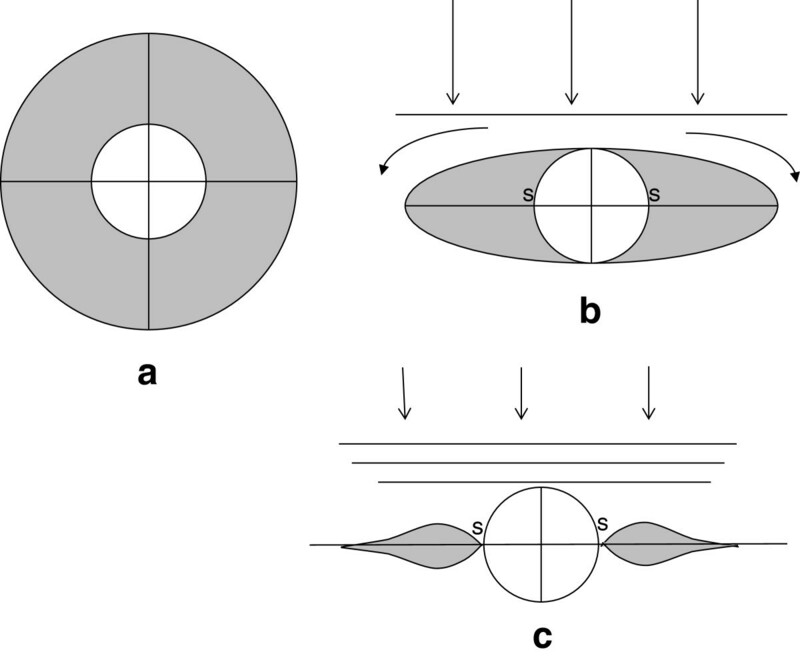 The process is depicted schematically in Figure 10, which shows three phases of the compaction. Two shadow zones arise during the compaction near the femur (marked “s” in Figure 10). In the shadow zone the compaction is less effective than at other places further away from the femur due to the shadow created by the large bone, which does not take part in the compaction (a, b and c). This variation in the compaction of the corpse creates a variation in the concentration of Hg with the approximate shape of a sine wave. 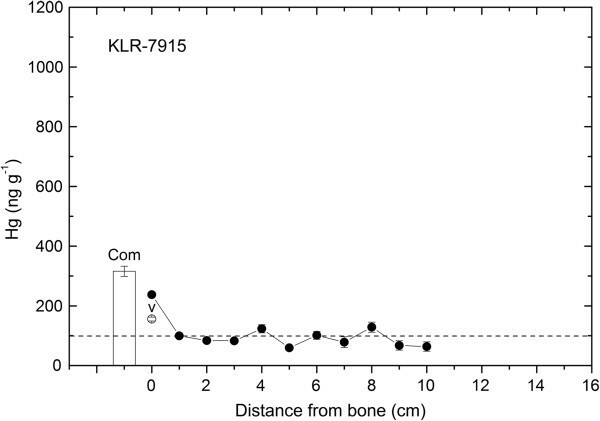 Such a variation in the Hg concentration as a function of distance to the femur is seen fully developed in Figure 9, but is also discernible in Figures 5 and 6. Had the Hg not been present and in-place, it is very unlikely such a systematic variation should occur. Schematic diagram depicting three phases of the compaction of the soft tissues of a corpse. The two shadow zones caused by the intact femur are marked with “s”. The white central area signifies the femur bone, and the shaded circle surrounding the bone signifies the soft tissue with a content of Hg. But how about the soil samples of the inner organs: lungs, liver and kidneys – do the Hg concentrations determined in the soil really give a fair picture of the Hg concentrations of these organs when the individual was alive? In modern man it has been shown that the clearance of Hg from the human body gives rise to high concentrations of Hg in the kidneys and in the liver. Hac et al. reported an average Hg concentration of 29.9 ± 22.0 ng g-1 in liver tissue samples from 46 suddenly deceased modern day Polish citizens, while Iyengar and Woittiez  found liver Hg concentrations ranging from 33–490 ng g-1 in ten modern individuals. Baselt  reported normal ranges in modern man as follows: lung 20–300, liver 160–1300 and kidney 200–2600 all ng g-1. All the numbers reported in these modern studies are within the same order of magnitude as the concentrations reported in this study for soil samples. Although these similarities are striking, it is very difficult to make a direct translation between the Hg concentrations measured in the soil to the Hg concentrations in the once living soft tissue. The consequences of the measurements and interpretations presented here is that the chemical life history hypothesis (see Rasmussen et al. and Skytte and Rasmussen ) for Hg can be extended to encompass times in life later than the 5–10 years revealed by the compact femur bone . In case of the kidneys the Hg half-life is 64 days and for the lungs 1.7 days (Hursh et al.). It is not clear precisely what the half-lives are of the other soft tissues like liver and muscles, although it is probably safe to assume that they are measured in days. We present measurements of Hg in soil samples near the skeletons of seven medieval individuals from two Danish cemeteries, Lindegaarden in Ribe and Ole Wormsgade in Horsens. A sample of femoral bone and a series of adjacent soil samples near the femur were procured for each individual, as well as soil samples from positions which were once kidneys, liver and lungs, whenever these positions could be located with certainty in the field. Two individuals showed no excess Hg exposure in the soil samples above the background level of ca. 100 ng g-1. Two individuals had moderately high Hg concentrations in the soil samples, and three exhibited exceptionally high Hg concentrations in the soil samples. The bone and soil Hg concentrations are consistent with an interpretation of Hg from the decomposed soft tissue still being present and in-place in the soil now surrounding the skeleton. The Hg data can furthermore be interpreted as the exposure history of Hg through life of the individuals, similar to the interpretations of chemical life history proposed for the skeletal organ by Rasmussen et al. and Skytte and Rasmussen . However, the times in the life of the individuals covered by the soil samples are much nearer to death than is the case for the bones – the kidneys ca. 64 days prior to death and the lungs ca. 1.7 days prior to death. Such data and their interpretation open for new possibilities in deciphering the lives of single individuals living in medieval Denmark. Morten Søvsøe and Helene Agerskov Madsen from Sydvestjyske Museer and Marie Foged Klemensen from Horsens Museum are sincerely thanked for giving permission to sample the skeletons and for allowing us access to take soil samples while they were working on their excavations. The financial support of the VELUX Foundation to the project ‘1000 year’s people’ is gratefully acknowledged. KLR coordinated the study and drafted the manuscript. NR performed the fieldwork. LS and NR carried out the chemistry laboratory work. JLB made the anthropological examinations. All authors read and approved the final manuscript.